Earlier today, a press render of the alleged Samsung Galaxy Tab S2, giving us a glimpse of what the tablet may look like. We’ve heard about the tablet on several occasions in the past, and it seems Samsung has inadvertently confirmed the existence of the Galaxy Tab S2. 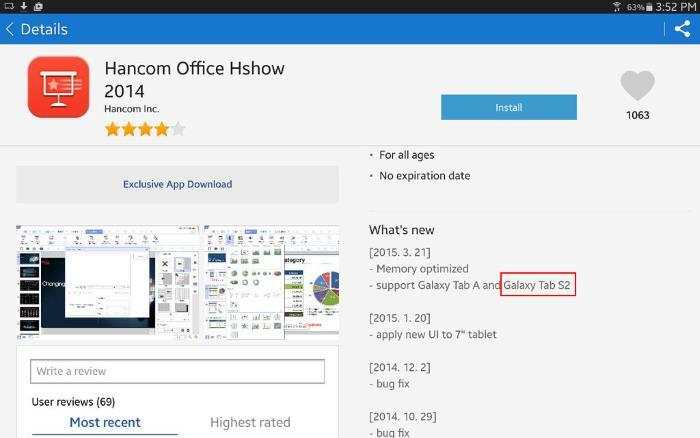 The confirmation of its existence comes from the change log of the Hancom Office Hshow app, which lists support for Galaxy Tab A and Galaxy Tab S2 which is yet to see the light of the day. The alleged Samsung Galaxy Tab S2 is expected to come in two screen sizes: 8-inches and 9.7-inches. The display will reportedly come with a resolution of 2048 x 1536 pixels, a 64-bit Exynos processor, 3GB RAM, 32GB storage, microSD card slot, an 8-megapixel rear-facing camera, and a 2.1-megapixel front-facing camera and will ship with Android 5.0 Lollipop as its operating system out of the box. The tablet is expected to see the light of the day in the coming months, and will launch in key markets across the globe. We’ll update you if we hear anything more about the tablet, it’s pricing and availability details.